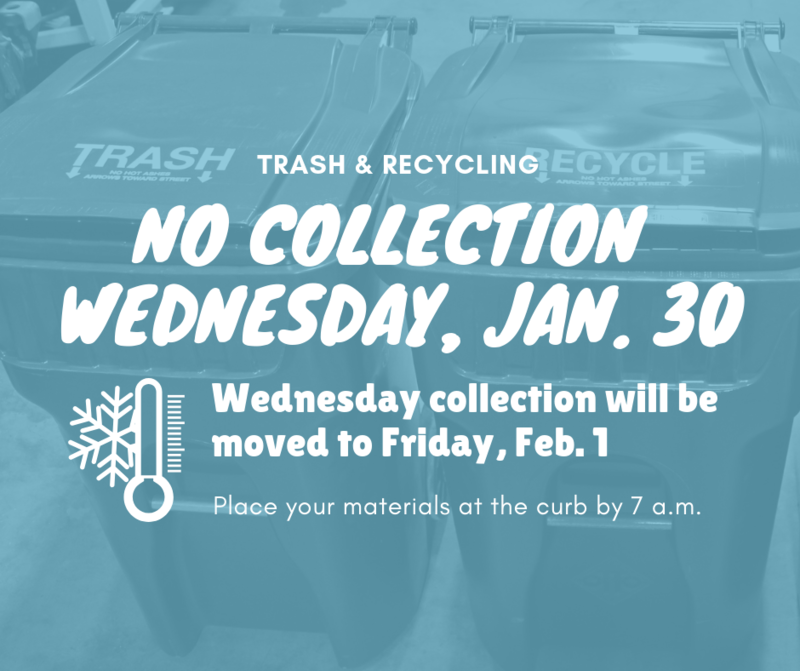 Due to the pending extreme cold weather, curbside collection of trash and recycling will not occur on regular routes on Wednesday, Jan. 30, 2019. This cancelation is being implemented to ensure the safety of our staff. Crews will complete Wednesday's routes for trash and recycling collection on Friday, Feb. 1, 2019. Thursday’s and Friday's trash and recycling routes will be run regularly. Items should be to the curb by 7 a.m. to ensure collection, but note that collection times will vary to ensure staff has time to warm up as needed. To assist the crews’ efficiency, only set out your items if absolutely necessary. For questions, contact 319-356-5151. Attributable to the bitterly cold temperatures, Iowa City will begin the suspension of its weekly organics collection a few days early. Beginning Wednesday, Jan. 30, 2019, yard and food waste collection will no longer be regularly collected. Regular weekly service will resume Monday, March 18. Curbside organics collection takes a break annually to conserve fuel and limit expenses during late winter when use is reduced. Food and yard waste pick up will continue to be offered during this break by appointment. To schedule, call 319-356-5151 at least 24-hours prior to your regular collection day. Sign up for curbside collection service notices at www.icgov.org/subscribe.